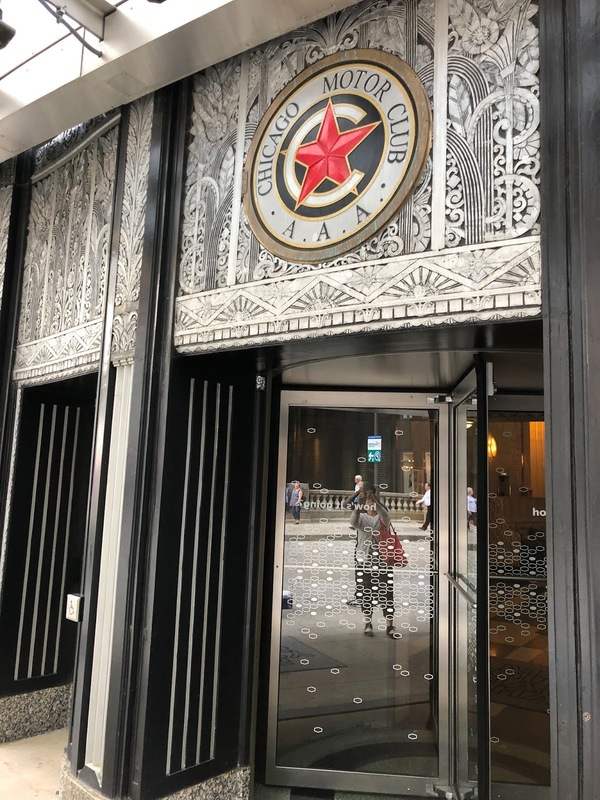 Here's a quick look at the old Chicago Motor Club which is now a Hampton Inn just steps from the Chicago River and Michigan Avenue where Katrina and I stayed in June. The 16 story Art Deco skyscraper was built in 1928 by Holabird & Root for the Chicago Motor Club and opened in January of 1929 to exchange travel information and promote the automobile. The group began marking what it considered the best routes to and from the city, placing road signs to assist drivers without detailed maps. Katrina didn't see me sneak up the mezzanine stairs! 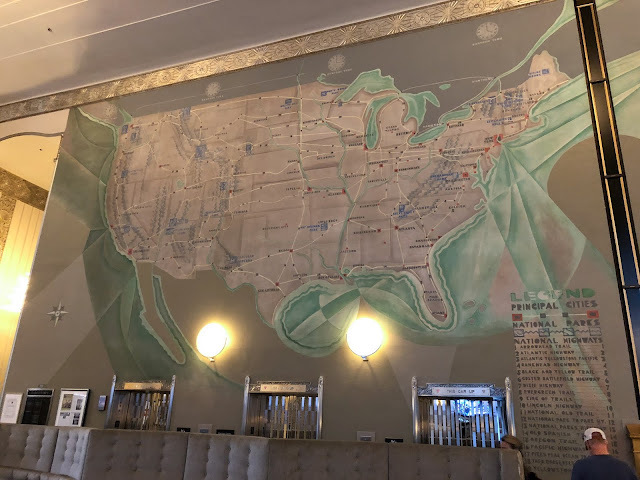 The twenty-nine foot wide mural on the west wall was designed by the notable muralist John Warner Norton, it depicts an abstracted map of the United States which includes major national highways, parks and cities. 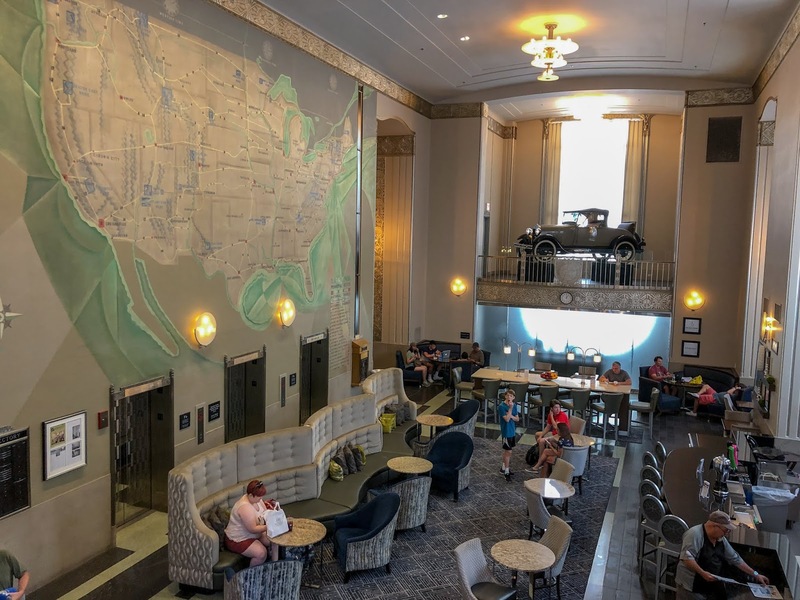 The mural is a lovely piece reeking of Art Deco with sawtooth zig-zag lines indicating mountain ranges, and vibrant seafoam green bodies of water. 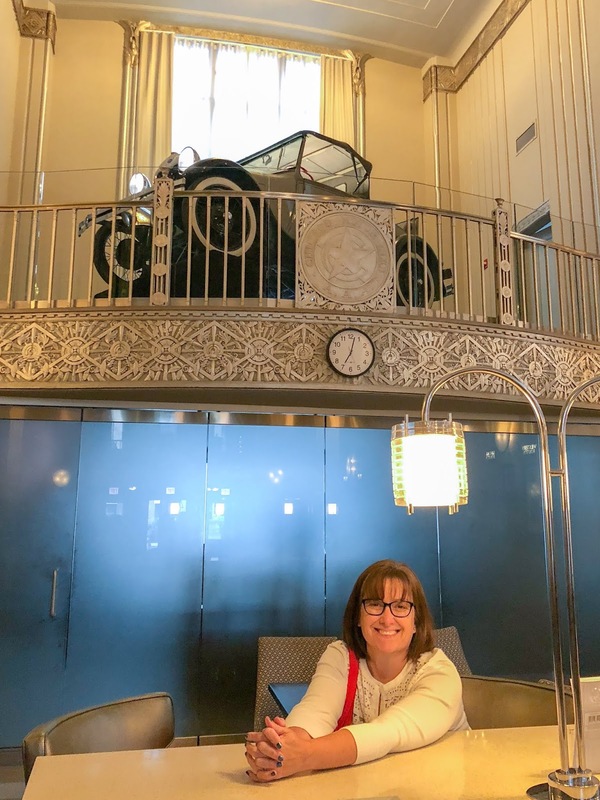 The Chicago Motor Club was not just a social or sporting group as many auto clubs had been. It wielded power in advocating for city improvements. Nineteenth-century roads were made for horse-drawn carriages and streetcars and were by that time deeply rutted. 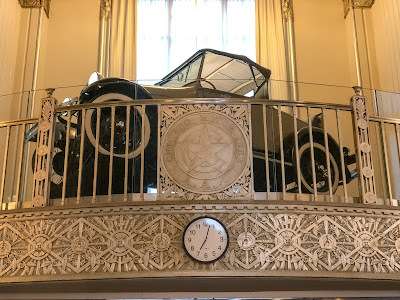 The middle-class could now afford automobiles and Daniel Burnham’s Plan in 1909 for the city of Chicago called for urban changes to accommodate the increased auto traffic. 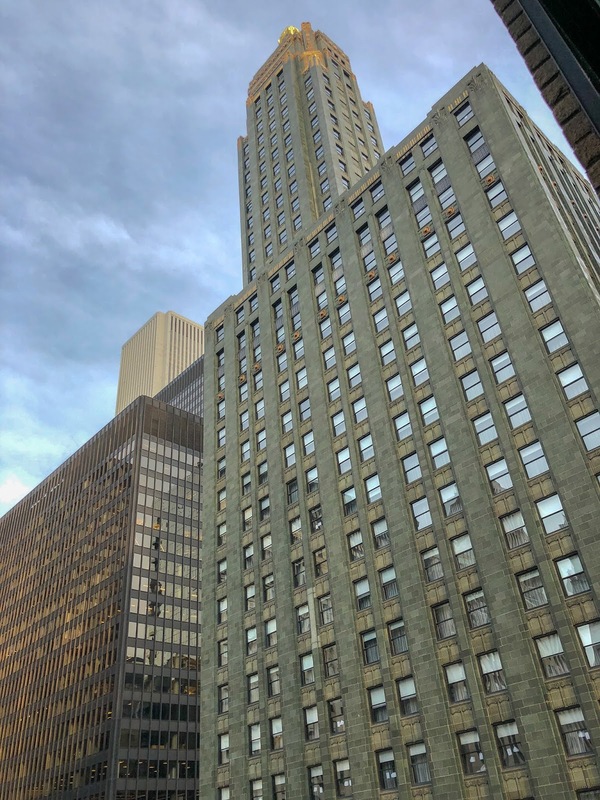 North Michigan Avenue was widened by 1920, a public parking garage was built in Grant Park (1921), and Wacker Drive was transformed into a double-decker motorway by 1926. Coordinated traffic control signals in Chicago were implemented in 1925 and roads all over the city were now better surfaced and safety concerns for motorists and pedestrians alike were brought to the fore with the help of the Chicago Motor Club's influence. In those times "motoring" was seen as an escape from urban congestion, giving one freedom to explore the beauty of the country. I recently purchased the book "Motor Girls" about the women who were taking to the road to pursue adventure and freedoms most hadn't been able to access before. Loved the low relief wall decorations! 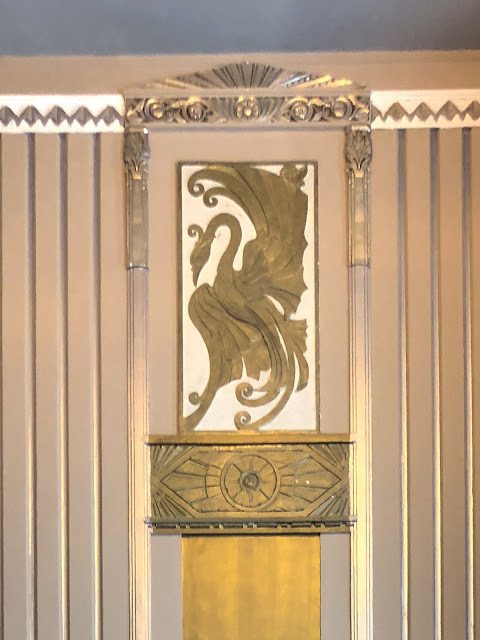 Art Deco buildings often emphasize verticality, simplicity, hard-edged forms, geometric patterns, low-relief designs, and lavish materials. The style celebrated the Jazz Age, the Machine Age and all things modern. Wildly popular during the 1920s to the early 1930s, it fell out of favor when the Depression and World War II made it seem frivolous and wasteful. After taking one of those silver-clad elevators up the first thing I did when we got to our room was climb over the desk to open the window - and was thrilled to discover we had a view of the Carbide and Carbon building! 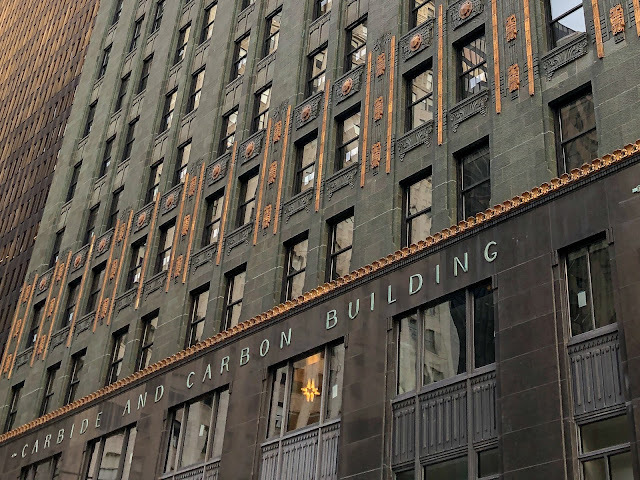 So far it's my favorite in Chicago, not only is it Art Deco delicious, but how many buildings have you seen in this striking color combination? Here's a link to a previous post of mine with all the details. 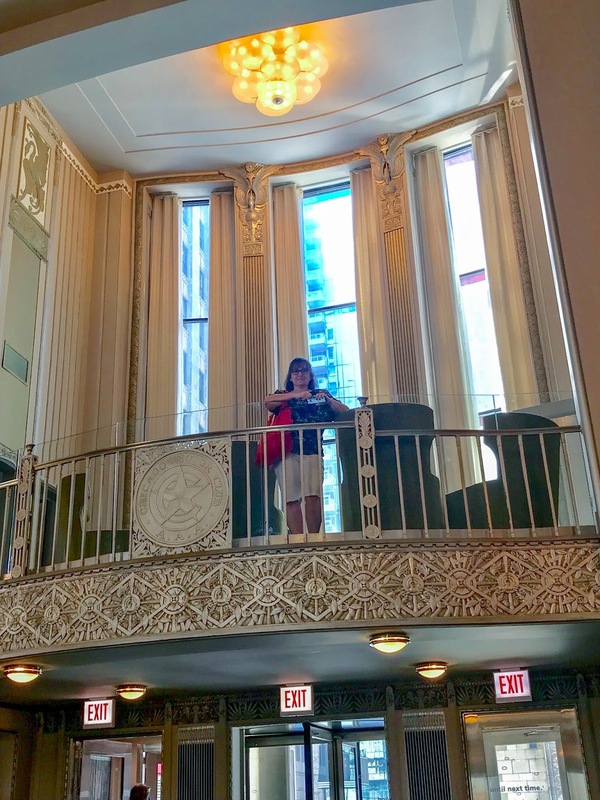 If I ever stay overnight in Chicago again you can bet I'll be staying at the building's new St. Jane Hotel, so named in honor of Chicagoan Jane Adams. Or at least I'll swing inside and poke around, you know how I love to do that!